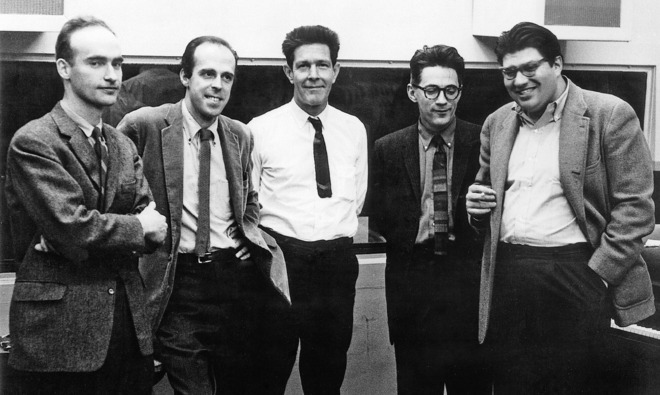 The “New York School” in 1962: Christian Wolff, Earle Brown, John Cage, David Tudor, and Morton Feldman. Click play for the seventh episode of No Sounds Are Forbidden. Host Matthew Friedman explores the profound impact of the work and ideas of John Cage on the American avant-garde. Seeking to liberate sound from the restraints of conventional music, Cage introduced new compositional practice based on chance, and nurtured a generation of composers whose music was in a state of continual change. This episode features an interview with the composer Christain Wolff, and music by Cage, Wolff, Henry Cowell, Morton Feldman, and Sonic Youth. You can download Karlheinz Essl’s Fontana Mixer, a generative sound environment based on Cage’s Fontana Mix here.